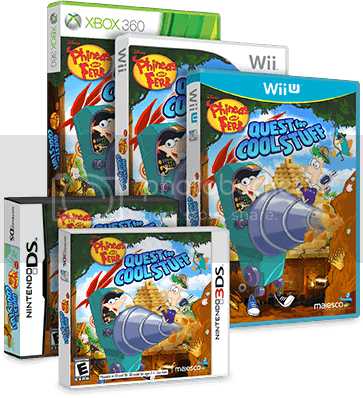 Play as Phineas, Ferb and Perry/Agent P and interact with fan-favorite characters from the show including Dr. Doofenshmirtz, Candace, Isabella, Buford and Baljeet. Action Mode: Take Perry from subdued pet mode to crime-fighting Agent P to battle hordes of robot “inators” and sneak past traps and obstacles in Dr. Doofenshmirtz’s diabolical lab. You can buy it now for Wii U, Wii, Nintendo 3DS, Nintendo DS,and Xbox 360 wherever video games are sold. Phineas and Ferb: Quest for Cool Stuff is rated E for Everyone.